Step 1 The pre-design phase. Initial meeting between the client and Position by Design, to determine scope of project and profile of the community. This is where we will discuss client expectations, budget and building process. Step 2 The design/presentation phase. 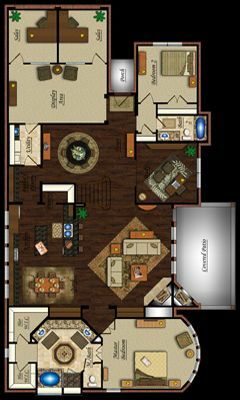 Position by Design will present to the client CAD/ color rendered floor plans (space planned to scale), material boards complete with interior specifications, and furniture and drapery selections. We also provide color photographs of furniture selected by room. Step 3 The final design phase. Once the project is approved by the client, Position by Design will provide interior selections, and construction drawings of walls, flooring and built-in cabinetry. We work closely with your design center, your construction managers and your sub-contractors throughout construction. Step 4 The ordering phase. Position by Design orders furniture, artwork, rugs, and accessories job-specific; at this time our purchasing department will place orders for all merchandise for the client’s project. Step 5 The installation phase. Our team of designers and merchandisers will install the project quickly and professionally to meet the client’s needs. We believe it is important to schedule a walk-through to ensure that every detail is completed to your satisfaction. Position by Design is available to “fluff” or refresh your model home every 6 months for a nominal fee.